Please read carefully the terms and the instructions of this site, and also the "Delivery" and "Return" sections on each item before order. When you order one or more items on the site www.JRVshop.eu means that you understood and accepted all the conditions set out in these pages, all subsequent complaints being unfounded. JRVshop.eu web site is owned by SC JRV Exclusive S.R.L. Photos, slogans, drawings, images, logo and trademark are the property of the online store www.JRVshop.eu being part of the headquarters and/or locations of the S.C. JRV Exclusive S.R.L., or partners. 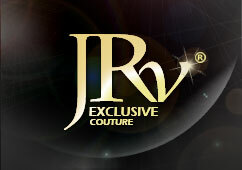 JRV Exclusive Couture is a registered trademark, and copyright, and other intellectual property rights do not allow any reproduction, transfer, publishing, transmition, display and modification of data and images on this site, no copy or electronic recording and any creating material derived by unauthorized persons, not belonging to SC JRV Exclusive S.R.L. The reproduction on paper or on digital devices of certain elements of this site can be used only in a purely personal interest and not for advertising and/or commercial interest, so that must be complied with laws concerning the intellectual property. The website, and everything in it, including all text and images, banners, slogans, logo are the property of JRVshop.eu and its partners, and the total or partial reproduction is prohibited without the written agreement of S.C. JRV Exclusive S.R.L. The violation of any security systems of the JRVshop.eu website, any reproduction, representation, use or modification of the partial or full data is strictly forbidden and leads to civil liability and / or criminal, according to the Romanian legislation. All data you fill in the order form online: name, address, telephone number or e-mail will remain strictly confidential. S.C. JRV Exclusive S.R.L. will use your personal data only to send order confirmations to complete the shipping, if possible promotions to provide assistance when needed, etc. JRVshop.eu online store is committed to protect the personal information you provide, undertakes to not make public databases containing information regarding your personal data, to not provide your email address or phone number to third parties and so on. The prices of the items displayed on the site are final, but DO NOT include the shipping cost. We offer three options of payment for the ordered items: PayPal, Credit Card or via bank transfer. The items are delivered based on the invoice paid. After the confirmation of the payment if the item is in the stock, will be sent the next day, and you will receive the tracking number of the package via your email address. Shipping is made by DHL Express for all countries, the prices and the shipping time for each country can be found on every page of the item in "Shipping". Because there is no guarancy about the permanent existence of all items/measurements presented on the site in stock, the shipping time may vary. For items that are not in stock a period of approx. 7 to 14 days is added. Before you pay the order, the approximate date of the shipping will be told to you by email. Each item is accompanied by related tax documents, which will be found in the package. The customers of the online JRVshop.eu may return the purchased items without penalty and without giving any reason, under certain conditions. If the item that was ordered from the www.JRVshop.eu does not suit you, or simply you came to the conclusion that you do not like it, you can return it within 3 days from the reception! To register an application for exchange/refund click here: Form for exchange/refund. Retrieving data or any items of this site is prohibited. They cannot be exposed on other sites. You cannot transmit, use, reproduce, publish, you cannot create derivative works, you can transfer images and content of this site only for personal use and not commercial, the essential condition being that you comply with the regarding information on Copyright or other intellectual property rights. It is forbidden to use the site to post or transmit any material that is threatening, false, misleading, abusive, licentious, libelous, vulgar, or any other material that could constitute or encourage conduct that can give rise to crimes, or can lead to civil liability or other violatations of any law. It is forbidden to use this site to advertise or perform any request/commercial offer without the written permission of S.C.JRV Exclusive S.R.L. References to specific links are prohibited. We are not responsible if you purchase similar items excluded S.C. JRV Exclusive S.R.L. from other sites that have unauthorized links to the site www.JRVshop.eu. Also, SC JRV Exclusive S.R.L. does not authorize any content or any other items and services provided on such sites. If you go through a link like this, you assume your personal risk. 7. Reviews of these terms and conditions. JRVshop.eu online store may at any time modify any information on this site: increasement/decreasement of prices, adding/removing items in/out of stock, exchange or return, etc. without notice. JRVshop.eu may revise the terms and conditions on this website, by updating them. S.C. JRV Couture S.R.L., VAT Number: RO35053784 is the official partner of SC JRV Exclusive S.R.L., owner of online store www.JRVshop.eu, these conditions are similarly applicable.